Regular Dances are $6 a person with concessions also being sold. The Farewell Dance is $10 but all snacks and activities are included in the price. Students must follow the vicariate Dance Guidelines. These must be signed and on file at the student's school. Click Here to download. ,Cell phones can be brought to dances but will be collected in baskets, organized by school. This keeps our children focused on each other and prevents unwanted photos from being taken. If a student needs to call home, the school chaperons will allow the child to use their phone. ​Why does MCES host 3 dances? 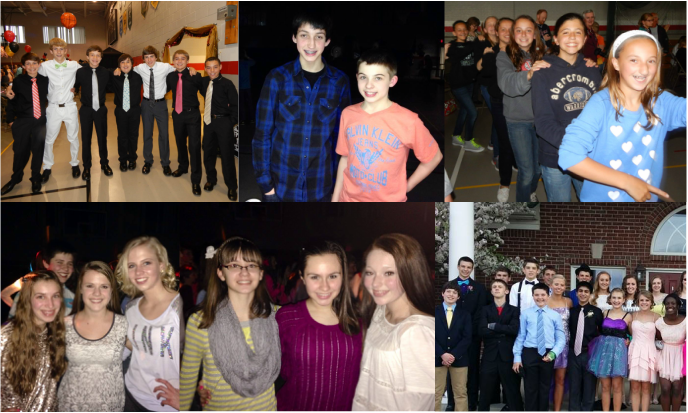 MCES host three dances annually to represent our three Parishes: St. Michael, St. John and St. Mary. Do NOT encourage going with dates, Encourage groups to go together and celebrate the end of the 8th grade's Catholic Grade School Experience. Shop for dresses on sale and consider the same dress for confirmation or graduation. Do NOT send your student to school with food, gifts, flowers or balloons to ask a fellow student to Farewell... save these activities for High School.